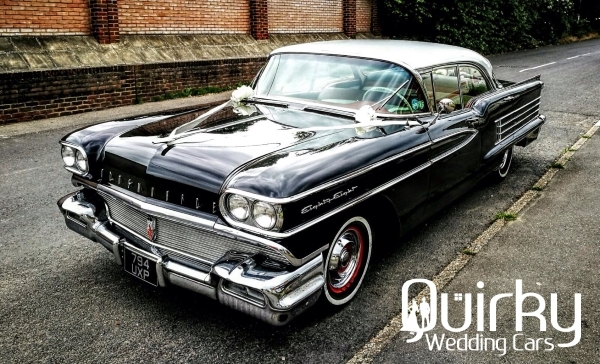 If your looking to arrive in style with a classic American wedding car in romantic flair, we have Old Red, a 1958 vision of the future from the space-inspired 1950s. Fast but smooth and with room for 4/5 passengers. Many a romantic date was picked up in the V8 Rocket 88, as is told in the song “Rocket 88”, a hymn of praise to the joys of the Oldsmobile Rocket 88 automobile which had recently been introduced. Jackie Brenston (Ike Turner’s saxophonist from his Kings Of Rhythm band) along with his Delta Cats, released the song which hit number one on the R&B charts in 1951. So if you need something a bit different with room for the family, this might be the Wedding Car for you.